How Far is Confident Cygnus II? Confident Cygnus -II a part of mega ultra-mode Township, Confident Canopus, is being developed on prime land spread over 81 acres near Hoskote on Chinthamani Road. 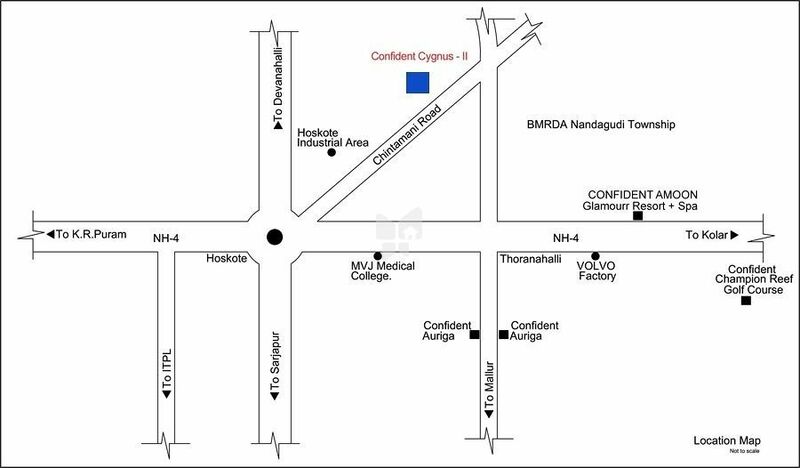 Confident Cygnus -II is situated at a short drive of 30 minutes from Bangalore city. Thanks to its advantageous and well connected nature, the project has ample scope for soaring appreciation value in the near future. BMRDA is planning development on 15000 acres of land, a Nandagudi Township that’s close to the projects vicinity, transforming it into a sought after and highly desirable project! The daily water requirement for domestic usage for proposed residential areas will be worked out as per BWSSB standards of 120 ltrs per capita per day water supply will be provided and lines are proposed on eitherside of the corridor avoiding the need for road cutting along the corridor. 10% of the total layout area would be for park area.